Angolatitan, of which Sauroposeidon may have been a close relative (Wikimedia Commons). For years, pretty much all we knew about the fancifully named Sauroposeidon derived from a handful of cervical vertebrae (neck bones) unearthed in Oklahoma in 1999. These aren't just your garden-variety vertebrae, though--judging by their massive size and weight, it's clear that Sauroposeidon was one of the largest herbivorous (plant-eating) dinosaurs that ever lived, outclassed only by the South American Argentinosaurus and its fellow North American cousin Seismosaurus (which may well have been a species of Diplodocus). A few other titanosaurs, like Bruthathkayosaurus and Futalongkosaurus, may also have outclassed Sauroposeidon, but the fossil evidence attesting to their size is even more incomplete. 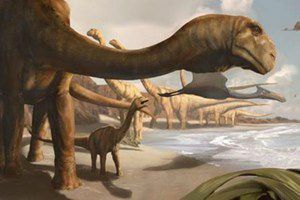 Judging from the still-limited evidence available, what set Sauroposeidon apart from other enormous, elephant-legged, small-brained sauropods and titanosaurs was its extreme height. Thanks to its unusually long neck, this dinosaur may have towered 60 feet into the sky--high enough to peek into a sixth-floor window in Manhattan, if any office buildings had existed during the middle Cretaceous period! However, it's unclear if Sauroposeidon actually held its neck to its full vertical height, as this would have placed enormous demands on its heart; one theory is that it swept its neck and head parallel to the ground, sucking up low-lying vegetation like the hose of a giant vacuum cleaner.